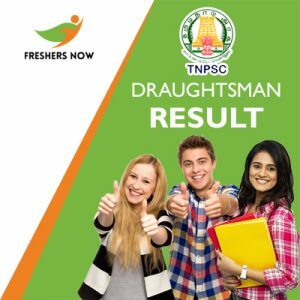 Tamil Nadu Public Service Commission(TNPSC) is going to release the TNPSC Draughtsman Result 2019 in the month of March 2019. Lakhs of candidates attended for the held TNPSC Draughtsman Written Test on 3rd February 2019. We know that many of the candidates are eagerly waiting for the Result. Also, along with the TNPSC Draughtsman Result, the officials are planning to release the TNPSC Draughtsman Merit List. Moreover, the candidates need to wait with much more patience for the Result and the TNPSC Draughtsman Grade-III Cut Off Marks. As known, cut off marks and the merit list acts as barriers in the selection process. So, aspirants should have a clear idea of these too. For all those, we provided the complete details of them in this article. Furthermore, you can get all the data by scrolling this post. The aspirants can check the table given below for very brief information. This section contains an overview of the TNPSC Draughtsman Result and also the Job Location will be in Tamil Nadu only. As per the standards of the Tamil Nadu Public Sevice Commission, the Draughtsman, Grade-III Job is a very good chance for the hopefuls to enter into such Board. Scroll down for lot more details. Tamil Nadu Public Service Commission is recruiting for 53 Draughtsman, Grade-III posts. There is huge competition for this role and many people attended for the Exam on 3rd February 2019. Thus, the candidates need to wait with more patience, as they are releasing those in the month of March 2019. Moreover, knowing your Result helps you to know your grade in the Examination. So Far, after downloading the Result, you should make them hard copies for other professional use. Furthermore, you can also get more details regarding the Results, Cut Off Marks, and The Merit List from below sections of this post. The Officials of Tamil Nadu Board are preparing the Cut Off Marks based on the number of candidates attended for the examination, analysis of the cut off marks previous year, difficulty level of the question paper, Number of vacancies etc. Also, the officials notified that the Cut Off marks will be different for different categories. As known, Cut Off Marks are the minimum marks a candidate should secure in the Written Exam. The cutoff marks vary for both Male and Female Candidates. After getting the Result, the hopefuls should wait for the Merit List. Also, knowing Merit List is very important to get placed into Tamil Nadu Government. So, the candidates can check this section for more details of the Draughtsman, Grade-III Merit List. Likewise, the TNPSC Draughtsman Merit List is released on the official site only. So, the candidates should check the Merit List to know whether they got selected for the TNPSC Draughtsman, Grade-III Job or not. Moreover, the Merit List contains the list of candidates who secured the Highest marks and got very good rank by qualifying all the barriers of the Cut Off Marks. First, move to the official site of Tamil Nadu Public Service Commission(TNPSC) i.e www.tnpsc.gov.in. Now, you will see the results column on the right side of the Homepage. Next, you can see the Results page. Fill the details like Registration number, and password. Finally, you will get your tnpsc.gov.in Draughtsman Grade-III Result on the screen. Hence, hope we had given you the complete information regarding the TNPSC Results and the TNPSC Draughtsman Grade-III Cut Off Marks. For more similar updates, keep in contact with us and don’t forget to bookmark our website www.freshersnow.com. Leave a comment in the below section for any queries.